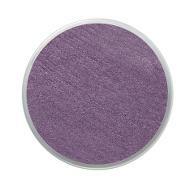 Use Sparkle Lilac to paint a large arch about 1.5cm above the right eyebrow. 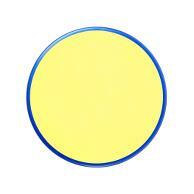 Then paint a slimmer arch about 2cm below the left eye. Now take some pale yellow and paint and arch underneath the purple on the right brow and one underneath the bottom left purple arch. Paint a white flower at the top of the nose, followed by some swirls around it. 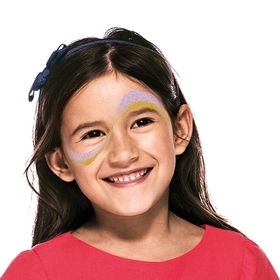 Then draw a white wavy line across the right cheek, with some smaller lines above and below. Finally, paint a white line curling upwards above the left eyebrow, with a short white line above and below. 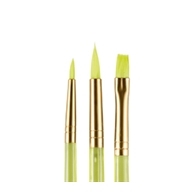 With a thin brush and white paint, draw a series of crosses to look like twinkles above the right brow and below the left eye. Finish with lots of little white dots to look like sparkles.